Moto2 got the crowd fired up for a terrific day of racing at Silverstone for the British Grand Prix weekend. 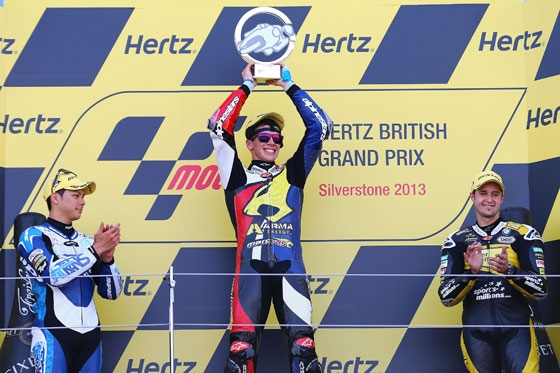 Scott Redding showed why he is the championship leader with a controlled and fairly dominant run, bar some tussling with Takaaki Nakagami and Tom Luthi at the midway point, to take a historic win as the first from Britain to win the intermediate class since Tom Herron’s 1976 win at the Isle of Man. The Marc VDS man shrugged off competition from Italtrans rider Nakagami, who after some position swapping settled for second for the third weekend in a row ahead of Interwetten Paddock’s Tom Luthi for his second consecutive podium, signalling his return to form. Fourth was taken by Tuenti HP 40 rider Tito Rabat, who tried but just couldn’t catch the lead trio, ahead of Dominique Aegerter who enjoyed his 27th consecutive points finish. Sixth across the line was Marc VDS’s second bike, piloted by Mika Kallio. Next to finish was Johann Zarco, who gave title hopeful Pol Espargaro plenty to think about with a big battle for position, handing even more advantage to Redding and making a difficult weekend for the Spaniard even worse. Ninth and tenth respectively were the NGM Forward Racing bikes of Simone Corsi and Mattia Pasini, with eleventh and twelfth going to former lightweight class champions Nico Terol and Julian Simon. The remaining points went to Aspar’s Jordi Torres in 13th, NGM Mobile Forward Racing rider Alex De Angelis in 14th and inaugural Moto2 champion Toni Elias taking the final point for Blusens in 15th. Brit Danny Kent finished 18thafter a tough weekend while wild-card Gino Rea fell right at the end of the race. Moto3 had to wait ’til last but was just as action packed with Luis Salom back to his old tricks, leaving it to the closing laps to make his move for victory aboard his Red Bull KTM Ajo. Joining hm on the podium were the Estrella Galicia team of Alex Rins, who remained competitive despite seeming to have some bike issues and Alex Marquez who took his second podium finish. This meant that though the podium was still all KTM and Spanish, it did not feature Maverick Vinales for the first time this season, the Team Calvo rider lead the race but ended up fourth. Fifth went to the Mahindra of Miguel Oliveira the first non-KTM rider to cross the line after battling past Jonas Folger in sixth for Aspar (Kalex KTM) and the top Honda of Jack Miller in seventh. Alexis Masbou took eighth ahead of Jakub Kornfeil in ninth the second Mahindra of Efren Vazquez in tenth and a busy Isaac Vinales in eleventh. Romano Fenati improved to 12thfor San Carlo Team Italia just in front of fellow Italian Niccolo Antonelli in 13th, the final points went to Brit John McPhee in 14th and Niklas Ajo who after a strong start dropped to 15th. Racing Steps wild-card Kyle Ryde finished 27th, Wayne Ryan crashed after getting tangled with other riders in the opening stages. Previous Previous post: Crescent Suzuki boss, Denning: "we do have concerns as to why the bike that caused the oil slick was even out there on the track"
Next Next post: Rossi secures best finish at Silverstone "We never give up"